May as well make it a Lucky 7, ehhhh??! This will be a quick post (for me!). It's another Simple Simon card -- done with embossing (Cuttlebug) the swirl pattern onto a pre-made card. Then I cut the butterfly and its shadow, using the Cricut Cake Basics cartridge. You'll note that I added antennae -- jewelry wire -- onto which I put Swarovski crystal beads. I dressed up the butterfly by applying Stickles glitter glue (I lovethat stuff!!!) and affixing a computer-generated sentiment. This card would be easy for me to mass produce, as I usually have a flock of butterflies hanging around my Craft Loft. Whenever I have scraps leftover, I do a quick-cut of a butterfly and I keep them to use on random quick cards whenever needed. 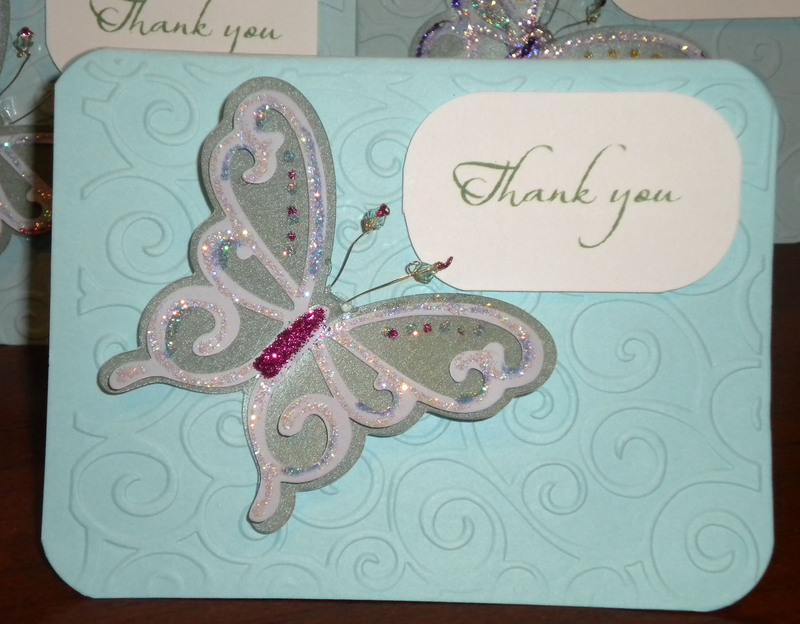 BLOG CANDY, Card 7: Additions to your "thank you ensemble" ... you'll be getting a thank you rubber stamp (mounted on wood), the Cuttlebug Thank-You embossing folder, and ... some butterflies! For more information... how to win the Blog Candy, entries into the Grand Poohbah drawing, and next stops on the hop, please see the next post. Dinner is in the oven, and I'm rushing!!! WOW I am lucky to get one done in a day, I am way slow. thanks for sharing another card and for the chance to win. Such a pretty card, love the butterfly. I'm a huge stickles fan too. I love the swirls and glitter. Butterflies are one of my fav things. Oh my gosh, you've out done yourself on this one,so much I beame a follower to watch what else you can do . LOve this card. I am a butterfly aholic also. and I want all the blog candies. Yes I am greedy, easy to be when you are not very lucky. Hope your dinner was great. Very pretty. I need to follow your example and keep different cuts as I go along.....Then I won't be rushing at the last minute. Very pretty. Love the embossing and the butterfly is gorgeous! Love the butterfly card gorgeous! I think I have everything I need to copy your beautiful card. My mom loves butterflies. Thanks for letting me be a follower. I'd like to be entered into Card #7 blog candy and... Card #7 is very pretty. I like the idea that you used wire and put a bead on it for the antennae. Very clever! Wow - I love your butterfly card - It is beautiful. I just became a follower and look forward to viewing your other creations. Thanks for the inspiration. Your card is beautiful!!! I love the antennae (what a great idea!)! I like your idea of using the scraps to make extra butterflies, too. Can't wait to see your monkey (they're my favorite animal)! Very pretty card! I saw you commented on the Creative Charms blog candy and I just wanted to pop over and say hi!